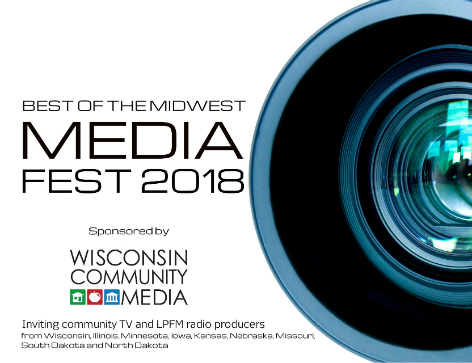 Best of the Midwest Media Fest Award Winners of 2018! Excerpts from Excellence Award-winning programs and Best in Show Award-winning shows will be featured and producers are invited to say a few words on stage. A still from the programs of Achievement Award winners will be shown and producers will be asked to walk across our stage and receive an award. Merit Award winners will be recognized during the Exhibitors Reception and will pick up their awards prior to the start of the show. CONGRATULATIONS to all of you! You should have received a letter in the mail telling you about the Fest results. This was sent to the address provided to us as the "producer address." If you have not received this letter, check with your community media center or LPFM radio station. If your center doesn’t have it, please call me (Mary) at 608-215-5594 or email me at [email protected]. This letter includes the information that will customize your award and an Entry number you will need to order (your entry number can also be found here). Banquet tickets are $45. This includes entry to the Exhibitor Fair, the Exhibitor Reception, the Banquet, and the Show. The reception begins at 5:00 pm and the Banquet begins at 6:30 with the show following immediately. Banquet ticket ordering is on the same form as award ordering. If you have registered for the conference with either a Thursday Day Pass or with a Full Conference registration, the Banquet is included. First 3 words of your program title – We ask for this to be sure we have the right program. Changes to producer names – Provide any changes to the names of producers here. Other Changes – Provide any other changes. We have been able to hold the line on pricing for awards. (We've even reduced the price on statuettes this year!) There is no tax so the price you see below is the price you pay. MAILING FEE (per item) $10 If you do not plan to attend the banquet, please add this fee to your order.